VIRDI, JAIPREET and MCGUIRE, COREEN 2018. Phyllis M. Tookey Kerridge and the science of audiometric standardization in Britain. The British Journal for the History of Science, Vol. 51, Issue. 01, p. 123. Mester, A. F. and Stephens, S. D.G. 1984. Development of the Audiometer and Audiometry. International Journal of Audiology, Vol. 23, Issue. 2, p. 206. Stephens, S. D.G. and Goodwin, J. C. 1984. Non-Electric Aids to Hearing: A Short History. International Journal of Audiology, Vol. 23, Issue. 2, p. 215. Watson, T.J. 1980. Disorders of Auditory Function. p. 1. Stephens, S. D. G. 1979. Hughes' Audiometer. British Journal of Audiology, Vol. 13, Issue. sup2, p. 11. John, J. E. J. 1979. 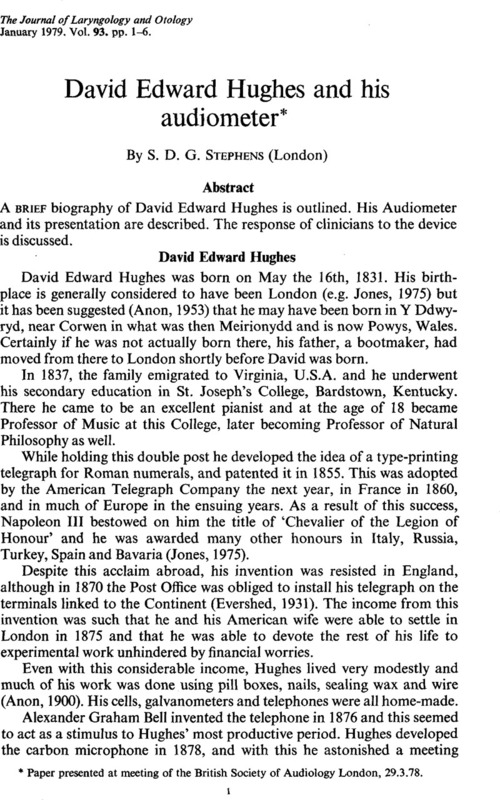 David Edward Hughes FRS. British Journal of Audiology, Vol. 13, Issue. sup2, p. 5. Stephens, S. D. G. 1979. Audiometers From Hughes To Modern Times. British Journal of Audiology, Vol. 13, Issue. sup2, p. 17. Royal National Throat, Nose and Ear Hospital, 330 Gray's Inn Road, London WC1. Paper presented at meeting of the British Society of Audiology London, 29.3.78. Anon (1900) Professor D. E. Hughes, FRS. Nature, 61, 325. Anon (1953) Y Bywgraffiadur Cymreig Hyd 1940. Anrhydeddus Gymdeithas y Cymmrodorion, Llundain. Blake, C. J., and Reik, H. D. (1906) Operative otology. Appleton, London, Sydney. Brown, E. M. L., Bothman, L., Shambaugh, G. E., and Hagens, E. W. (1931) The Practical Medicine Series. The eye, the ear, nose and throat. Bunch, C. C. (1941) Laryngoscope, 51, 1100. Dalby, W. B. (1885) Lectures on diseases and injuries of the ear. 3rd. edition. Churchill, London. Dalby, W. B. (1893) Diseases and influences of the ear. 4th ed. Churchill, London. Dench, E. B. (1896) Diseases of the ear. Henry Kimpton, London. Evershed, S. (1931) Journal of the Institution of Electrical Engineers, 69, 1245. Gray, A. A. (1910) The ear and its diseases. Bailliere, Tindall and Cox, London. Gruber, J. (1890) A text book of diseases of the ear. (Translated by Law, E. and Jewell, C..) H. K. Lewis, London. Hovell, T. M. (1894) A treatise on diseases of the ear. Churchill, London. Hughes, D. E. (1878, a) On the action of sonorous vibrations in varying the force of an electric current. Proceedings of the Royal Society, 27, 362. Hughes, D. E. (1878, b) Compte Rendu Hebdomadaire des séances de l'academie des Sciences, Paris, 87, 1079. Hughes, D. E. (1879) On an induction-current balance and experimental researches made therewith. Proceedings of the Royal Society of London, 29, 56. Jones, W. M. (1975) David Edward Hughes, FRS. Gwyddonydd, 13, 8. Lewandowski, R. (1883) Wiener Medizinische Presse, 24, 1389. McBride, P. (1884) A guide to the study of ear disease. W. and A. K. Johnston, Edinburgh. McKenzie, D. (1927) Diseases of the throat, nose and ear. 2nd ed. Heineman, London. McNalty, A. S. (1950) Sir Benjamin Ward Richardson. Harvey and Blythe, London. McNaughton-Jones, (1887) Practitioners handbook of diseases of the ear and nasopharynx. Churchill, London. Pritchard, U. (1886) Handbook of diseases of the ear. H. K. Lewis, London. Putnam, J. J. (1880) Boston Medical and Science Journal, 103, 474. Richardson, B. W. (1879, a) Proceedings of the Royal Society of London, 29, 56. Richardson, B. W. (1879, b) Medical Times and Gazette, i, 557. Richardson, B. W. (1879, c) Journal of the Franklin Institute of Philadelphia, 78, 110. Simpson, Hall I. (1941) Diseases of the nose, throat and ear. 2nd ed. E. and S. Livingstone, Edinburgh. Watkyn-Thomas, F. W., and Yates, A. L. (1932) The principles and practice of otology. H. K. Lewis, London. Urbantschitsch, A. R. von (1890) Electricity in the service of man. (Ed. Wormell, R. and Walmsley, R. M..) Cassell, London.